How to Convert WAV to OGG Easily with Bigasoft Audio Converter? This article will make some introduction about WAV and OGG and then show you how to convert WAV to OGG easily with Bigasoft Audio Converter for Mac. If you want to convert WAV to OGG, or OGG to WAV, or any audio formats such as MP3, WMA, APE, FLAC, OGG, APE, MP2, VQF, AAC, AUD, AIFF, CAF to OGG, Bigasoft Audio Converter will be your best choice. Waveform Audio File Format (WAVE, or more commonly known as WAV ) is a Microsoft and IBM Audio file format standard for storing an audio bit-stream on Pcs. It is an application of the Resource Interchange File Format(RIFF) bit-stream format method for storing data in "chunks". It is the main format used on Windows systems, suitable for retaining first generation archived files of high quality. However, the size of file in wav is large due to its high quality. The WAV format is limited to files that are less than 4 GB, because of its use of a 32-bit unsigned integer to record the file size header (some programs limit the file size to 2 GB). The size of a one minute, 44kHZ,16bit Stereo WAV file is about 10MB. OGG format is actually a container that potentially allows for different streams of audio, video and metadata. Ogg Vorbis is the compression format. It provides medium to high quality audio at between 16 and 128 kbps/channel and is better quality sound than mp3. The OGG file type is a lossy codec which means that data is discarded as part of the compression technique, resulting in a smaller file size. Ogg files are optimised for music files, but will still be of acceptable quality for speech only files. . It is supported by devices such as Archos and Samsung but is not supported by Apple iOS devices. Why do we choose Bigasoft Audio Converter to Convert WAV to OGG? First, it is the most powerful audio converters. Its powerful encoding and decoding ability will guarantee a fast, successful, and high quality conversion not only between WAV and OGG, but also between MP3, M4R, WMA, APE, M4A, FLAC, MP2, VQF, AAC, AUD, AIFF or any audio format that are available at present or any audio format available at present. Not only an audio converter, it is also a very powerful audio editor. You can change trim and merge the audio into one you totally like. Second, it is easy to use. It only takes three steps to convert hundreds of audios to other formats. 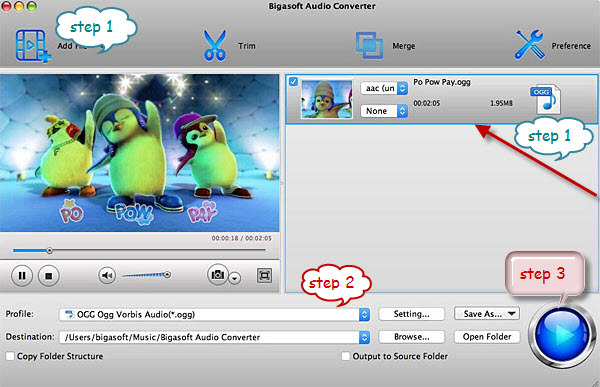 Bigasoft Audio Converter is the best way to convert WAV to OGG, and also the best way to convert between all audio formats available such as M4R, M4A, APE, WAV, FLAC, APE, MP2, VQF, AAC, AUD, AIFF. How to Convert WAV to OGG with Bigasoft Audio Converter? First, download and launch the Bigasoft Audio Converter for Mac to make preparation. Second, three steps to convert WAV to OGG with Bigasoft Audio Converter. Step 1 Add the WAV files you want to convert to OGG. Method 2: Click Add File and choose the WAV file that you want to convert to OGG. Tip: To do batch converting, you can add several files at the same time. Step 2 Choose the output format OGG. Tip: If you do not set the destination, the converted file will be automatically stored in the folder named Bigasoft Audio Converter. If you want to put it somewhere else, you can click Browse button and set the access manually. 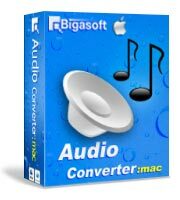 Bigasoft Audio Converter for Mac is the best way to convert WAV to OGG. It can not only easily batch convert hundreds of files from WAV to OGG easily with high quality but also convert almost between any audio formats such as MP3, WAV, APE, M4A, FLAC, OGG, APE, MP2, VQF, AAC, AUD, AIFF, and CAF. It is also a powerful Mac video to audio decoder which helps easily extract audio from video files like MP4, MOV, AVI, MPEG, MPG, 3GP, and more to audio files.